Explore the Best of the Golden Coast On Our California Adventure Vacations. California is a land of extremes. There’s Yosemite Falls: at 2,425 feet, it’s the 5th tallest waterfall in the world. There’s Tomales Bay: the state’s largest unspoiled coastal embayment. The tallest living organism on Earth, the giant sequoia, makes California it’s home, as does the world’s longest living organism, the Bristlecone Pine. California is also home to the rolling hills and vineyards of California’s Wine Country in Napa and Sonoma, and it’s home to Death Valley National Park where you can find some of California’s most impressive natural sights. While planning a California adventure can be tough (there’s so much to see and do! ), Austin Adventures has made it easy. From rappelling the 60-foot rock face at the base of El Capitan to hiking some of the most exciting trails in Yosemite and experiencing a Death Valley luxury adventure by jeep and bike, you’ll discover some of the best fun that California has to offer. Relax and ignite the adventurer within on these luxury California vacations. Beaches, vineyards, mountains, deserts and more! There is so much to see and experience in the Golden State, and if you know where you’d like to visit, below is some information that may help you decide when to go. Summer is peak tourist season everywhere in California, and while we may not recommend a visit to Disneyland during these months, we indeed suggest considering a trip to Yosemite National Park. Thanks to the spring runoff, the park’s waterfalls are especially stunning in early June. By July and August, most of the park’s roads are usually open, and you’ll find the best options for hiking because most of the trails are accessible. Although this is high season, this is the best time to visit wine country. Whether it’s Napa Valley or Sonoma, you’ll find harvest season to be a happening time. This is also an ideal time to visit nearby San Francisco if you want to enjoy warmer weather without having to deal with the summer tourist traffic. These months are ideal for paying a visit to Death Valley National Park near the Nevada border. The average daily high in February (when our Death Valley luxury adventure departs) is a comfortable 72°F, and these months are a fantastic time to explore this land of extremes without having to worry about extreme temperatures! Southern California is beautiful, but the beaches are often packed. If having a stretch of sand to yourself and paying lower prices are more important to you than perfect weather, hit up southern California in spring. San Diego is unusually empty – thanks to the cloud cover that comes every May – and as a result, it’s not hard to come by a good bargain or a “private” beach! Since you’re on our website, we’re going to assume that you’re interested in California’s beautiful national parks that we visit: Yosemite National Park and Death Valley National Park. If you’re planning a trip to either park, below are a few items that you’ll want to make sure you save space for in your bag. California is home to some of the most epic hiking trails in the country. Whether you’re just hiking for a few miles or the entire Pacific Crest Trail, you’ll want to have a pair of good quality hiking boots. But, if you don’t own hiking boots, please don’t buy a pair the day before you leave! For maximum comfort “break in” your boots first. This will ensure that you don’t suffer from painful blisters on your trip. From the waves in the Pacific to the alpine lakes in Yosemite, there are plenty of places to swim in California. Don’t get caught in this state without a swimming suit! 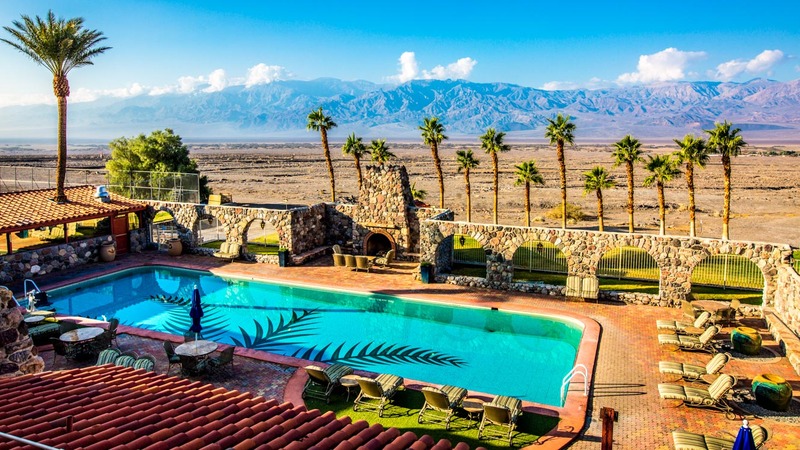 You can even swim in Death Valley – the driest place in the continental U.S. Travelers on our brand new Death Valley adventure vacation stay at Furnace Creek Resort which has two spring-fed swimming pools. Every year, more than 200 million travelers visit California. Many of those visit our favorite national parks, Death Valley and Yosemite, and many of those end up missing out on what we think are some really neat things. Below are some of the tried and true must-dos that we hope you’ll have time for! Okay, John Muir has been dead for some time now, but this Scottish-American naturalist played a significant role in the establishment and preservation of Yosemite National Park. If you have a chance, learn a little about this remarkable man who devoted his life to making sure that others could fully appreciate this special place. The more you know about John Muir, the more you’ll be able to see the park through his eyes and fully enjoy its wealth of beauty and nature. While in Death Valley, don’t miss what photographers refer to as the “golden hour.” This may conflict with happy hour, but trust us, you’ll be in awe of the magic that takes place over the Mesquite Sand Dunes as the sun sets. Sunrise is also a great time to photograph this sea of sand that has features you’ll probably never see again. Cell service in both Yosemite and Death Valley is spotty or non-existent in many places. Don’t schedule any important calls or plan on Instagramming as much as usual while you’re traveling in these parks! If you’re worried about not being able to use Google Maps, pack a GPS or pick up a map at a visitors center.